Free download Smokin’ Guns game for Windows PC. It is a supper action game. If you have played Quake 3 Engine game ever. 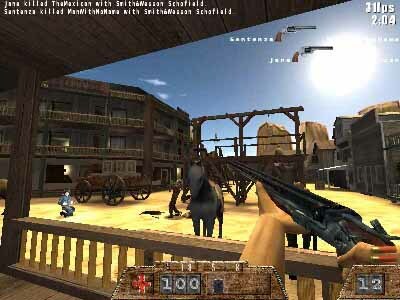 Just suppose that you have given touch of Wild West appearance to Quake 3 Engine, you will get exactly Smokin’ Guns game. It is also named as Western Quake because of its similarity to Quake 3 Engine. It has been set in Wild West which has many of interesting and complex features. It is multiplayer supported game. There is not necessary to having same server. It may be hosted by you or any other server. There are lots of weapons which can be used for shooting. Player has many maps and locations to play. You as being player will also have different kinds of game modes as well which is so much interesting for the game lovers. It also allows you to play single player mode against your computer. During game it sometimes it happens that your team member get stuck while crossing any door. At the result you have to kill your companion because you will have no more option. Its multiplayer game mode gives fun to player. If you want to be host o the game then you have to join any of the online servers available on internet. You will definitely enjoy this game.